In the money market, we often deal with pure discount instruments. The purchase price of a pure discount instrument is lower than its face value. The difference between the face value and the purchase price is called the dollar discount and it's the investor's only profit. Pure discount instruments such as U.S. Treasury bills (known as T-bills) are quoted as the value of the discount expressed as a percentage of the face value. In other words, they are quoted on a bank discount basis. annualizes with simple interest, so it does not account for the opportunity to reinvest interest. The holding period yield (HPY) is the return on an investment earned over the life of the instrument remaining after the purchase, including any additional cash flows. Note that this formula is actually the same as the formula for the holding period return (HPR). The effective annual yield (EAY) is an annualized return that takes compounding into account and assumes that one year equals 365 days. The effective annual yield can be explained as the interest that you could earn over one year if your funds were immediately reinvested on the same conditions. Note that this formula is actually the same as the formula for the effective annual rate (EAR) from reading 6 in your CFA curriculum. Assume you've bought a T-bill with a face value of USD 10,000 for USD 9,600, 180 days before its maturity. What are the bill's dollar discount, bank discount yield, and money market yield? for the effective annual yield it is 365 days. 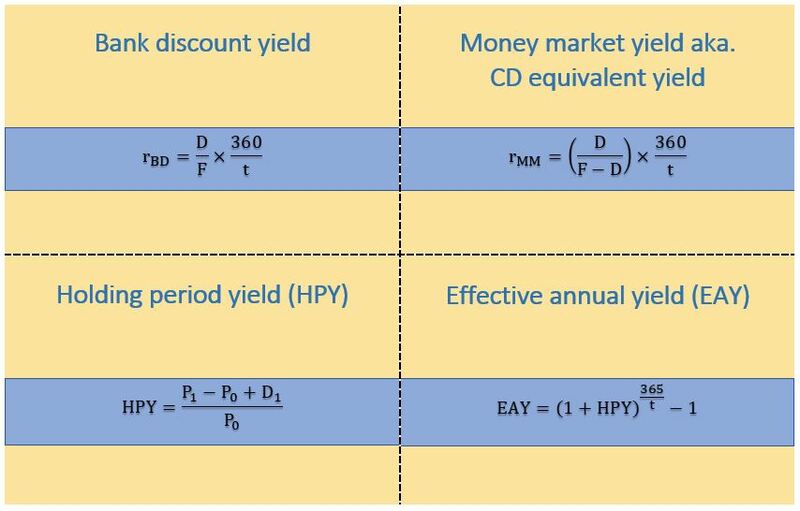 Also, remember that the bank discount yield and money market yield do not properly reflect the return on the investment.